As mentioned in the ForeFlight blog back in June, the familiar prog charts pilots use every day will be changing. 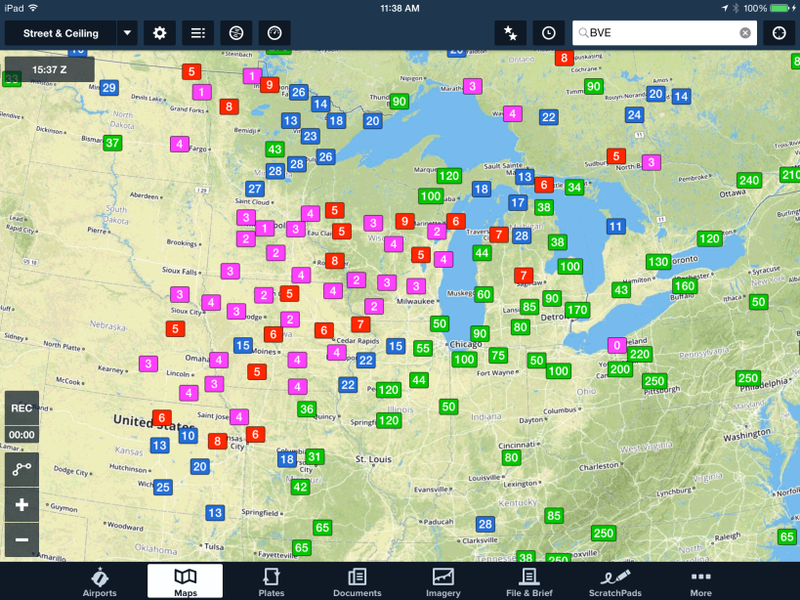 Hopefully you’ve had a chance to test drive these new NDFD prog charts that were introduced in ForeFlight Mobile 7.1. 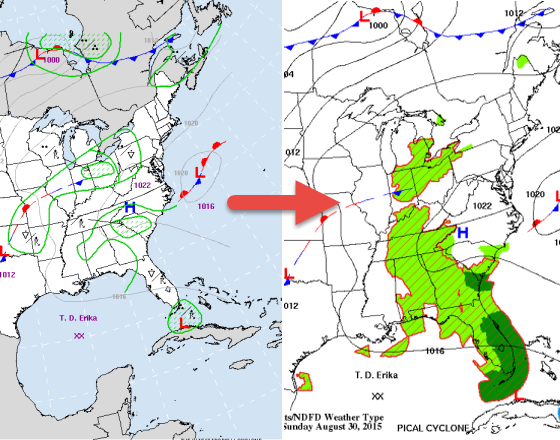 Beginning this morning (September 1, 2015) the precipitation forecast on these charts will now originate from meteorologists at the local NWS forecast offices and not from meteorologists at the Weather Prediction Center (WPC). For more information, you can read the official NWS notification. The precipitation shown on the new chart represents an instantaneous precipitation forecast. That is, it shows expected likelihood and coverage of precipitation (including type) at the valid time on the chart. Essentially the light shaded areas define at least a 15% chance and dark shaded areas define a 55% or greater chance of precipitation reaching the surface in that period. A legend in the lower-left corner designates the likelihood of precipitation (chance versus likely) as well as the precipitation type (snow, rain, mix, thunder, etc.). Nevertheless, the isobaric forecast along with high and low pressure centers and a forecast for the position of surface fronts will continue to be issued by the same meteorologists at the WPC. Legacy prog charts (left) are being replaced with the new NDFD Progs (right). It goes without saying that not every change is necessarily an improvement. It’s not that the other precipitation forecasts were bad; however, given that the precipitation forecast on this new chart is generated by meteorologists at the local forecast offices, it will be more consistent with the terminal forecasts (TAFs) and the local weather forecasts from weather.gov since the TAFs and local weather forecasts are issued by those same local meteorologists. Perhaps the biggest drawback of the new imagery is that the precipitation forecast now ends at the U.S. border although the isobaric forecast and forecast for surface fronts will still cross over into Canada, Mexico and coastal waters. Given that the legacy prog charts are no longer issued, we’ve moved the new prog charts from their initial home under the NDFD Progs collection to the Prog Charts collection where they will replace their legacy counterparts. Note that the extended forecast progs (Day 3 through Day 7) located in the Prog Charts collection will not be affected. 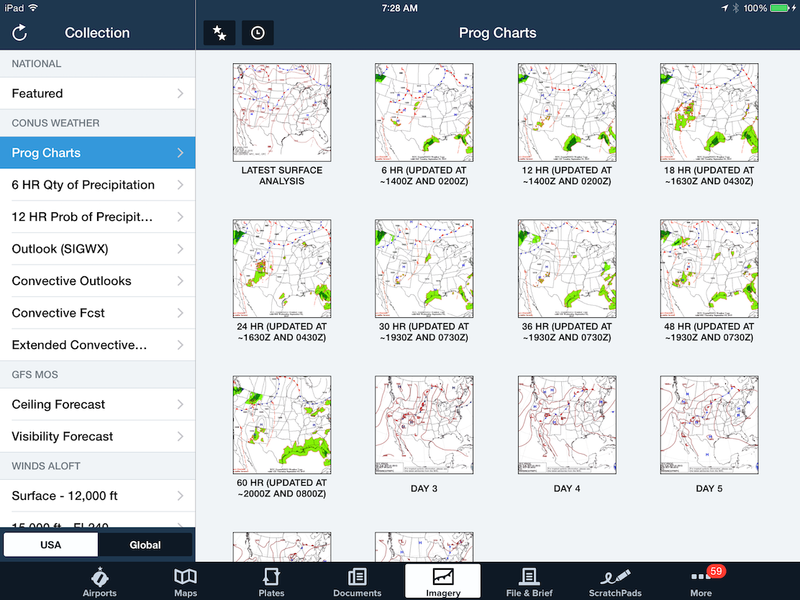 The result in ForeFlight is a single prog chart collection consisting of the latest surface analysis, new NDFD progs (6 to 60 hours) and the extended progs (Day 3 through Day 7). 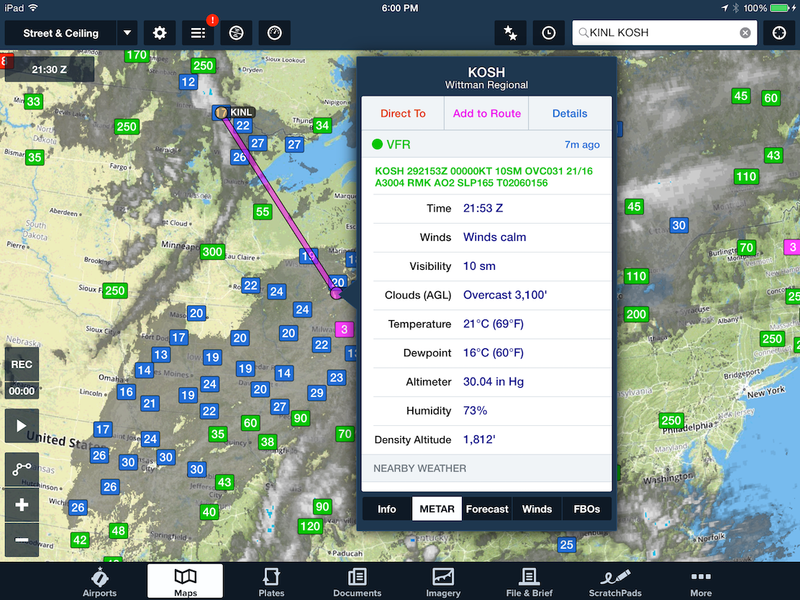 In this recent blog we presented a round-robin VFR flight from Oshkosh to International Falls. The concern was not the initial leg, but the return flight three days later. Would ceilings permit a VFR flight from International Falls back to Oshkosh on Saturday? The 75-hour GFS MOS forecast below provided clear guidance that a morning return would not be very likely given the IFR ceilings forecast along this route. But what really happened? Original 75-hour GFS MOS forecast valid at 1500 UTC for the return flight Saturday. This clearly shows that a VFR flight from International Falls to Oshkosh will not be possible in the morning. Turns out the GFS MOS was spot on with the ceiling forecast as shown below on ForeFlight Mobile. While low IFR conditions were much more widespread than forecast, much of the region forecast to be in the marginal VFR flight category or lower were indeed at or below marginal VFR. Actual ceilings at 1500 UTC as shown on ForeFlight. How about later in the afternoon? The 81-hour GFS MOS forecast below valid at 2100 UTC suggested the low IFR ceilings would give way to VFR ceilings making a VFR flight possible later in the afternoon. Original 81-hour GFS MOS forecast valid at 2100 UTC for the return flight Saturday. This guidance shows that ceilings were expected to improve later in the afternoon. By 2100 UTC as shown below in ForeFlight, ceilings began to lift and mix out throughout the early afternoon giving rise to VFR conditions along a good portion of the proposed route of flight. However, there were some marginal VFR conditions still remaining in the vicinity of International Falls and Oshkosh with a few stations reporting ceilings slightly below 2,000 feet. It took a couple more hours before the entire route was truly VFR. Still, that’s not a bad forecast for 3 days out with an error of just a few hours. The ceilings in the vicinity of the departure and destination airports remained slightly below VFR at 2100 UTC, but most of the route cleared as expected. While the GFS MOS guidance won’t provide this kind of clarity every single time, it does a surprisingly good job most of the time. Give it a go on your next round-robin flight.